The Antares 42, by Sarrazin Design, has timeless harmonious lines. She is elegant, in keeping with the spirit of the range. 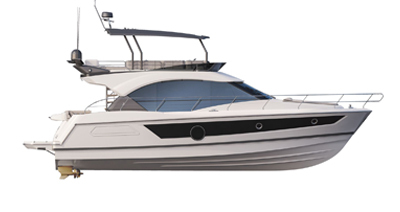 Her hull, well-known for its stability and comfort underway, offers engine efficiency second to none. The cockpit is spacious, deep and reassuring. 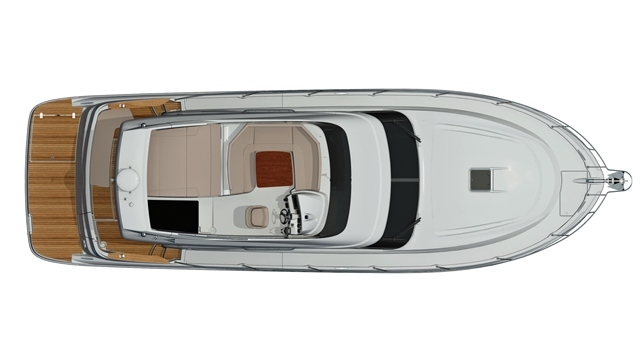 The deck plan’s ergonomics have been optimized to make moving around the wheelhouse easy and safe. Special attention has been paid to the design of the most recent of the Antares range, with warm Mahogany or high gloss Mahogany wood matching a wide selection of fabric or leather upholstery. The fittings are designed to make the most of life on board. The wheelhouse is really spacious and its atmosphere is bright and peaceful. The saloon’s facing seats will provide many a memorable moment. 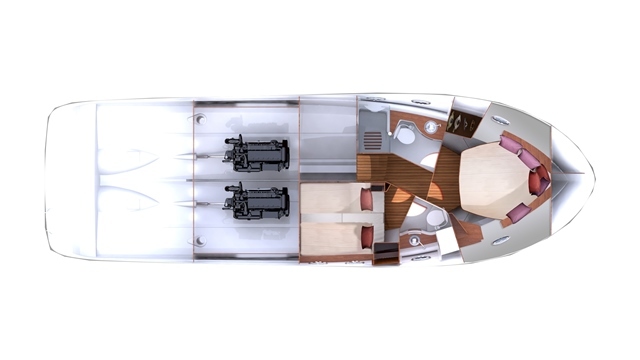 On the flybridge, the driving station has an adjustable seat on a rail system, a space for electronics, engine meters, electrical engine controls, as well as windlass, thruster and flap (optional) controls. The saloon comfortably seats 4 people around a solid wood table. A large sunbathing area transforms the flybridge into the ideal place to relax. A 30-litre refrigerated icebox is available on option. The owner’s cabin has a king-size central bed, storage drawers, a hanging locker and an office. The guest cabin has two twin beds. The saloon can be converted into a double berth. 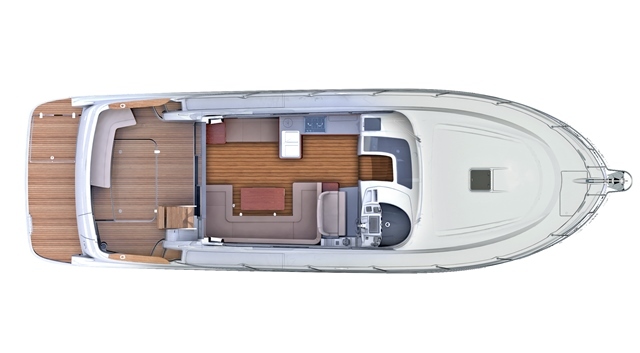 The Antares 42 saloon is laid out in a U-shape and has an additional facing seat. Her top-of-the-range upholstery and a recently redesigned bright atmosphere offer a very pleasant modern living space. Flybridge saloon for 4 people, natural solid wood table, 30 L refrigerated drawer under saloon seats. Twin VOLVO D6 2 x 370 HP engines. L-shaped galley: 2-burner gas hob, oven, 140 L refrigerator. U-shaped saloon 2.50 x 1.45 m and convertible wood table – cocktail – double berth. Facing seats. Bar unit. Driving station: adjustable twin seat, bolster function integrated. Large forward sun-lounger on option. Owner's cabin: central bed (1.85 m x 2.10), storage drawers, hanging locker, dressing table. Guest cabin: 2 ordinary beds that convert into a large double bed (1.60 m x 2 m).